One of the many recipes I made over the weekend and one of my favorites. I use Orange marmalade or Apricot Preserves. This is a keeper my friends....you'll love the flavors. See more photos in the comment section under this post. Be sure and click on the photos for drool mode! 1-2 teaspoons of liquid smoke (more if you like that smokey grilled chicken flavor). Arrange your chicken in a deep dish. Mix preserves, soy sauce, orange zest, pepper flakes and liquid smoke in a saucepan over low heat and cook until preserves have melted down. Pour only half of the sauce over the chicken and set the remaining sauce aside. 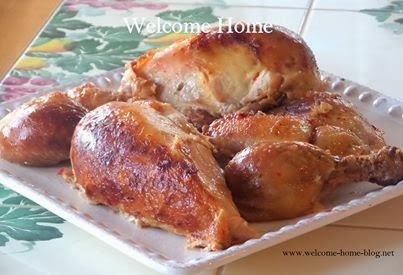 Cover chicken and place in the refrigerator for an hour. Preheat oven to 400 degrees. Add 1 tablespoon of cornstarch to the remaining sauce and stir over medium heat until warm and thicker than original sauce. 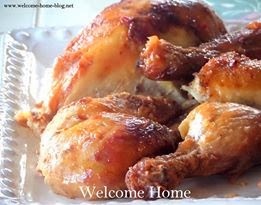 Remove chicken from the refrigerator and place on raised rack inside baking or roasting pan. Pour 1 cup of chicken broth under rack. Brush the thickened warmed sauce on top of the chicken and cover entire pan or dish with aluminum foil to keep the steam inside the pan while roasting. Make sure chicken is not laying in the broth. Bake for 40 minutes and then remove from oven. Remove foil and generously brush more sauce all over chicken. Turn heat down to 350 degrees and bake another 10-15 minutes uncovered. Baste once more until chicken is done. Remove from oven and allow to rest for 10 minutes before serving. Serve any additional sauce on the side.